The compressor generates the compressed air for the whole system. The compressed air from the compressor is stored in the reservoir. This maintains pressure in the reservoir at 8bar.When the pressure goes above 8 bar it immediately releases the pressurized air to bring the system to 8-bar pressure. This removes the moisture from the atmospheric air and prevents corrosion of the reservoir. This valve takes care of the whole system. Air from the compressor is given to various channels only through this valve. This valve operates only at 4-bar pressure and once the system pressure goes below 4-bar valve immediately becomes inactive and applies the parking brake to ensure safety. When the driver applies brakes, depending upon the pedal force this valve releases air from one side to another. This valve takes care of the parking brakes. 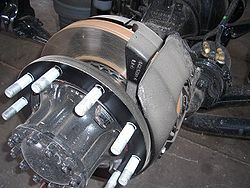 The air from the reservoir flows through various valves and finally reaches the brake chamber, which activates the S-cam in the brake shoe to apply the brakes in the rear.